Well today was another busy day. We caught the bus this morning to get a few more supplies and do some banking. We got back to the boat around 14:30. 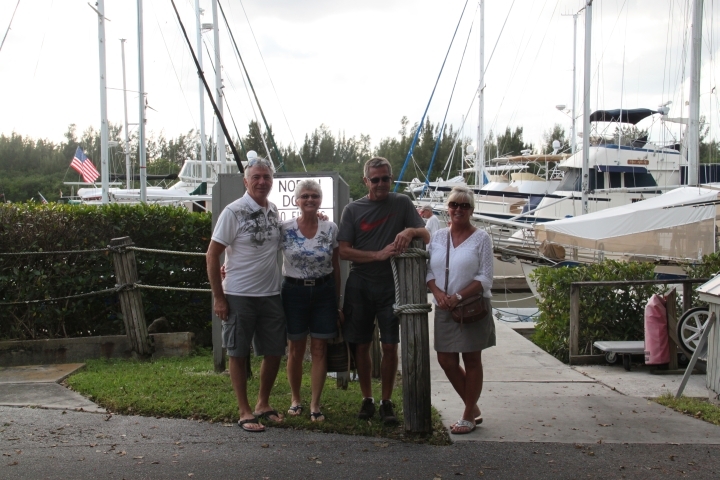 We had made arrangements to meet our friends here at the marina. Bill and Charlene Ross are from Moncton and Mike had worked with him at CN Rail. We first met them in Barrie when Mike and Bill worked at the yard in Toronto. Jean- Paul (JP) is also retired from CN and we met them when we were in Shediac this summer. They were our neighbours on the dock when we were there for 2 weeks. Also met up with them again in Baddeck when we were both sailing the Bra d’Or Lakes. 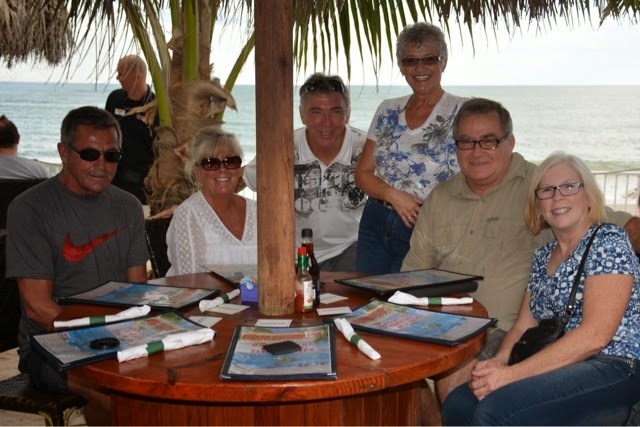 They drove us to the beach where we had supper at a great place called Mulligan’s. From the wonderful beach side tables, you could hear the ocean. It was so fun to see them and get caught up with their lives. Have a wonderful winter in Florida guys. We were up early this morning and dingied into the laundramat. While waiting for the clothes to dry, we chatted with a man who gave us lots of information on the Abacos. He too is waiting for the weather window to cross. The rest of the day was spent working on the auto pilot. Mike got the new part and we have it all back together. We will find out when we get off this mooring ball and head out, if it is actually working. Met a nice young couple who moored along side of us this afternoon. They are taking their 38 footer to the Exuma’s and the Turks and Caicos. I even got a nap in this afternoon. This evening was spent watching some new sitcoms on TV. January 8 Man was it windy in the night. I checked the anemometer once and it was blowing 32 kn. It blew hard all night long. We heard there was a cold front coming through and they were right. It was 14 C by the time we got up. Now I know that does not seem cold when our family in ON and NB have temperatures of -21 with windchills of -38. I feel for you all. That is bitter cold! But when you go from the high 20’s and low 30’s, we minded it. Thank you to our daughter in law Jody for telling her mom how much we loved the socks she knit for us the Christmas of 2013. She knit a few more pairs for us and they brought them to us when they came up to ON in December. So on this cold morning, Mike and I donned the woolies. Thank you so much Jackie. Today, we had hoped to start heading out but it was giving high winds and choppy waves on the ICW. Mike searched for batteries for Persuasion and found some in Stuart. He called and ordered them. The shop will be closed Friday, Saturday and Sunday as they will be at the Stuart boat show. We knew we couldn’t get there by their closing time at 16:00 so we called JP in Stuart and he said he would pick them up for us. Thanks so much. Now, we can have the weekend to get the old batteries out and the new ones in. It is 34 nm to Stuart so hopefully it will not be so windy tomorrow and we will head down. If not good going, we will stop in Fort Pierce. Sorry for not having any new photos for you. Staying in the same place for so long and working on the boat hasn’t given us anything new other than the one with our friends visiting on the 6th. Looking ahead at the weather, it is not showing favourable winds through to Monday but maybe Tuesday…..so we play the waiting game. What a view for dinner! Move to this side of the pond and you could join us. The view was indeed beautiful and the food and company was great too. It certainly was good to meet up with them. We had a great time. The deGier came up more than once. …..on your Blog of course! It was great to talk to you earlier this week, so nice to catch up on your Christmas stories. Yes it was good to talk and get caught up. Thought of you and Kees often today. Hopefully all went well. Yes, it was great hearing your voice and getting caught up on your wonderful Christmas having Mike home. What batteries are you changing out? Hopefully not the big 4D Lifeline; that was a very good battery. Yes I replaced the 4D batteries. I had got such good service out of them I replaced in kind. The new Lifeline don’t look as robust as the old ones. Light weight copper logs rather than the 1/2″ lead lugs on the old ones. Hopefully I will get 17 years out of these ones. P . S Ray is keeping his eyes open for the Winnebago! Yes, it would have been great getting together again. Love our visits with you guys. Take care of Ray. Glad he is keeping his eyes open for the Winnebago. Road trips are as fun as sailing trips. 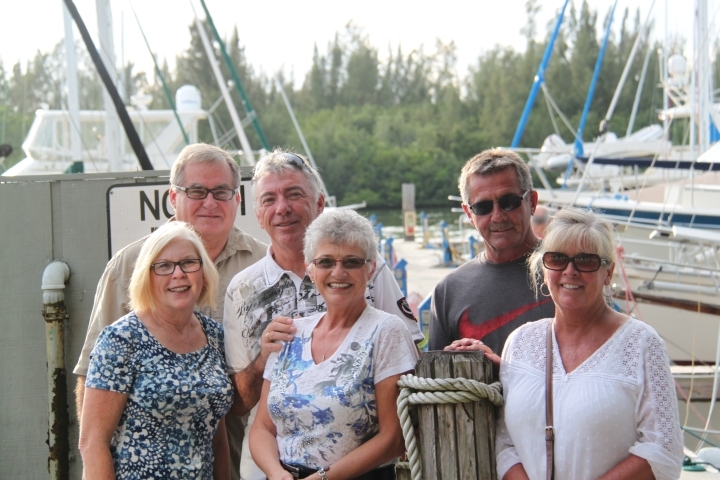 Speaking of sailing trips, hope you guys will be venturing to the Bahamas to visit us. Hope to talk to you again soon. PreviousJanuary 5 Happy New Year!